A few years ago, upon learning that 19 British prime ministers attended the Eton School in Windsor, Kiran Kulkarni considered whether the success of Eton students is attributable primarily to their own attributes or to the environment and curriculum that Eton provides. That is, could an ungilded student succeed at Eton, if given the opportunity, in the same way that children of privilege do? Upon research and reflection, Kulkarni concluded that the answer to that question is “yes,” and a vision was born. Kulkarni, a private equity investor who was born in India and lives in Toronto, set about trying to find a large parcel of waterfront property that could be developed as the site for an Eton-like international boarding school. He started in the Bahamas, he said, but found the government there to be far too unwieldy and bureaucratic. In March 2018, he moved on to explore possibilities in the United States — in California, Georgia and South Carolina. Finally, he registered the Casa Laxmi Foundation, which he serves as its CEO, in Florida, and the foundation purchased 260 acres on Fanning Bayou in north Bay County from homebuilding giant D.R. Horton. 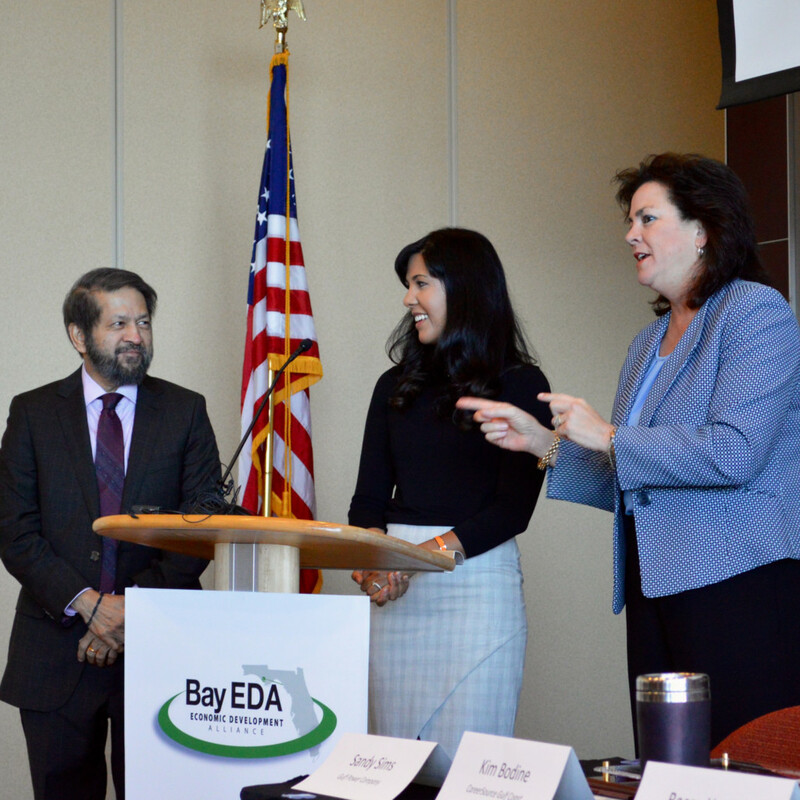 On Wednesday, the Bay County Economic Development Alliance, joined by Kulkarni and his daughter, Sonal Thomas, a member of Casa Laxmi’s governing council, announced that the foundation will be developing a K-12 school at the site; construction is slated to begin this year and the school will admit its first students (in grades 6-8) in 2021. The project will represent a capital investment of $117 million, and the school will employ 300 people making an average of $50,000 per year when it is fully operational, said Bay County EDA president Becca Hardin. Students will be admitted by invitation, Kulkarni told 850 Magazine, emphasizing that the Emotional Quotient of prospective students will be a consideration more important than their IQs. He is convinced that EQ is a far better indicator of leadership potential and selfless character. “You have a lot of people with high IQs who do horrible things,” Kulkarni said. The school, said Thomas, will focus on “producing great human beings, not academic scholars.” It will strive to instill in students “respect for self and others” and “respect for surroundings.” The school will work to keep its own environmental impact to a minimum by employing electric cars, relying on solar power and investigating the possible use of geothermal heating and cooling systems. Already, the school-in-the-making has developed collaborative relationships with leading universities including Yale, Penn, NYU, Stanford and Cornell. It has consulted the University of Guelph in Ontario regarding organic farming and plans to raise food for consumption by resident students. While the school will limit enrollment to 300, its plans include a Center for Excellence that will seat 600 people and serve as a venue for events open to the general public. An Expedition Center will be made available to community groups looking for a staging site for field trips. And the school intends to extend professional development training to teachers from throughout the area. Tuition for paying students will run between $100,000 and $150,000 a year. In addition, the school will admit, free of charge, “vulnerable” students who have lost their parents due to abandonment, death or incarceration. Its waterfront location will enable students to interact closely with a marine environment. Hardin stressed that the school, by enrolling students from throughout the world, will give Bay County invaluable international exposure. And Kulkarni emphasized that parents of students at the school will represent a highly connected and preeminently successful group. “Collectively, they will represent more than a trillion dollars in wealth,” he said.